Home / Read this if you’ve just gotten your Oboo! Read this if you’ve just gotten your Oboo! Congrats, we hope you’re excited! Let’s jump right in! What’s the first thing I should do when I get my Oboo? Once you’ve unboxed and plugged in your Oboo Smart Clock, you’ll want to connect your to WiFi! To do this, head over to the Oboo Web App at http://setup.getoboo.com – we recommend using a desktop internet browser! 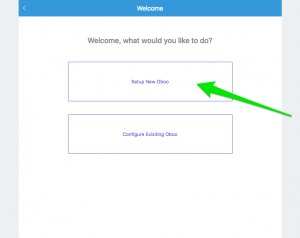 Once you reach the Oboo Web App, select Setup New Oboo and follow the steps that show up. Ok I’m done, what now? 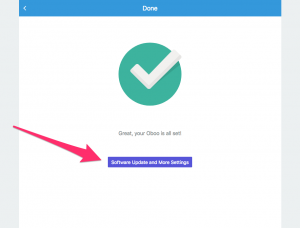 Now you should definitely update your Oboo’s software so you can get the benefit of all of the progress we’ve made so far. 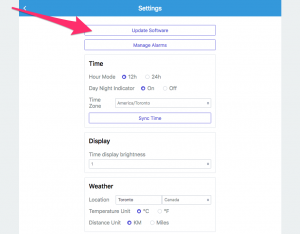 Hit the Software Update and More Settings button. Once you reach this page, hit the Update Software button. The software update will take 3 or 4 minutes. Sit back and relax for a bit – when it’s done, you’ll be greeted with a different looking Weather card! We’ve put together an Oboo “How To” guide that should answer any questions that you have. Does it have all of the features from the Kickstarter video? Not all of them just yet. We’re still working on the software and releasing updates as we go along. To get an idea of what’s currently working and what’s coming up next, take a look at our software status page.